Over the recent years the production of Ehrlich pathway derived chemicals was shown in a variety of hosts such as Escherichia coli, Corynebacterium glutamicum, and yeast. Exemplarily the production of isobutyric acid was demonstrated in Escherichia coli with remarkable titers and yields. However, these examples suffer from byproduct formation due to the fermentative growth mode of the respective organism. We aim at establishing a new aerobic, chassis for the synthesis of isobutyric acid and other interesting metabolites using Pseudomonas sp. strain VLB120, an obligate aerobe organism, as host strain. The overexpression of kivd, coding for a 2-ketoacid decarboxylase from Lactococcus lactis in Ps. sp. strain VLB120 enabled for the production of isobutyric acid and isobutanol via the valine synthesis route (Ehrlich pathway). This indicates the existence of chromosomally encoded alcohol and aldehyde dehydrogenases catalyzing the reduction and oxidation of isobutyraldehyde. In addition we showed that the strain possesses a complete pathway for isobutyric acid metabolization, channeling the compound via isobutyryl-CoA into valine degradation. Three key issues were addressed to allow and optimize isobutyric acid synthesis: i) minimizing isobutyric acid degradation by host intrinsic enzymes, ii) construction of suitable expression systems and iii) streamlining of central carbon metabolism finally leading to production of up to 26.8 ± 1.5 mM isobutyric acid with a carbon yield of 0.12 ± 0.01 g gglc -1. The combination of an increased flux towards isobutyric acid using a tailor-made expression system and the prevention of precursor and product degradation allowed efficient production of isobutyric acid in Ps. sp. strain VLB120. This will be the basis for the development of a continuous reaction process for this bulk chemicals. The finite nature of fossil resources necessitates the development of new technologies for the production of chemicals based on natural renewable feedstocks. So far, approximately 90% of all chemicals are produced from fossil-based supplies, but the world market for bio-based chemicals is expected to increase from $US 3.6 billion in 2011 to $US 12.2 billion in 2021 [1–3]. The rapid progress in the fields of metabolic engineering and systems biology accelerates this development and allows the synthesis of non-natural and non-inherent products . Atsumi et al. showed the production of higher alcohols via the amino acid catabolism by integrating the Ehrlich pathway into Escherichia coli. 2-keto acid intermediates were decarboxylated to the corresponding aldehydes using the 2-keto acid decarboxylase Kivd from Lactococcus lactis and were further converted by (host intrinsic) alcohol dehydrogenases to higher alcohols. Zhang et al. demonstrated the successful oxidation of isobutyraldehyde to isobutyric acid in E. coli, by overexpressing an aldehyde dehydrogenase. Isobutyric acid is mainly used as a precursor for methacrylic acid production and has a market size of about 2.7 ∙ 106 t a-1. In addition, isobutyric acid can be utilized for the production of sucrose acetoisobutyrate, texanol or di-isobutyrate . Isobutyric acid can be chemically produced by reacting propene, carbon monoxide, and water in the presence of strong acids . This chemical route suffers from its dependency on fossil products of oil refining and natural gas processes and the involvement of compounds harmful to the environment such as sulfuric acid, hydrogen fluoride, and boron fluoride . A major bottleneck of current bioprocesses is the susceptibility of microorganisms to toxic compounds [9, 10]. This results in low product titers and limited process stabilities having a negative impact on overall productivity. The cost competitiveness of biocatalytic processes is determined by these parameters  and it is indispensable to overcome these limitations. Pseudomonas species are known to exhibit mechanism enabling the adaptation to toxic environmental conditions . Importantly, these organisms are able to form stable surface associated microbial communities (biofilms), which have been described as potent alternative to planktonic cells regarding their application as biocatalyst, especially when solvents or otherwise toxic compounds are involved in the processes . Biofilms provide increased process stability and therefore potentially allow, in contrast to commonly used planktonic cells, a continuous process mode [14, 15]. Pseudomonads have a huge potential for bioremediation, and possess a rich pathway repertory for the degradation of a variety of non-natural and non-inherent toxic compounds such as aromatic organics [16–19]. Carbon is utilized in Pseudomonas wild types almost without the production of byproducts such as acetate , lactate, glycerol or ethanol, which improves carbon yields and simplifies downstream processing in comparison to organisms like Escherichia coli, Bacillus subtilis, and Saccharomyces cerevisiae. Under anaerobic and micro aerobic conditions, E. coli needs to produce mixed-acids directly from the key-precursor pyruvate to maintain an optimal redox and carbon environment for isobutyric acid synthesis, finally limiting the final carbon yield and affecting the downstream processing. In aerobic environment E. coli is known for its overflow metabolism under glucose excess conditions resulting in acetate formation . So far, mainly aromatic compounds are produced using recombinant Pseudomonas strains. The fermentative de-novo synthesis of e.g. phenol, p-coumarate, p-hydroxystyrene, t-cinnamate, and several polyhydroxyalkanoates [9, 23–27] from glucose have been reported as well as biotransformations using toluene or styrene for the production of 3-methylcatechol and (S)-styrene oxide [28, 29]. Moreover, Nielsen et al. reported the fermentative production of 1-butanol using an engineered Pseudomonas putida S12. Here the term ‘fermentation’ describes synthesis of the target product by whole cells directly from the added carbon and energy source, whereas ‘biotransformation’ refers to processes, where in addition to the growth substrate a biotransfomation substrate is added . This study aims to establish the solvent tolerant, genome-sequenced Pseudomonas sp. strain VLB120 [29, 32] as a platform biocatalyst for the fermentative production of isobutyric acid. Therefore the Ehrlich pathway is incorporated into a Pseudomonad with the aim to produce isobutyric acid via the valine synthesis pathway. In this work, strain specific limitations of Pseudomonas like low expression levels of recombinant genes and product and precursor degradation were solved by means of metabolic engineering. To evaluate the application of Ps. sp. strain VLB120 for the synthesis of isobutyric acid, the 2-keto acid decarboxylase Kivd from Lactococcus lactis was produced using a pCOM10 expression system. The resulting Ps. sp. strain VLB120 pCOM10-kivd produced isobutyric acid, isobutanol, and 3-methyl-1-butanol directly from glucose (Table 1). The presence of isobutanol and isobutyric acid indicate the existence of host intrinsic alcohol and aldehyde dehydrogenases in Ps. sp. strain VLB120 capable to oxidize or reduce isobutyraldehyde. In abiotic experiments no isobutyric acid formation could be detected. Product titers were significantly increased by the addition of yeast extract, which can serve as carbon precursor for the desired products. The production of 3-methyl-1-butanol can be explained by a withdrawal of 2-keto-isocaproate, the precursor of leucine biosynthesis, which is first decarboxylated and then reduced by host intrinsic enzymes to the corresponding alcohol . Cultivations (72 h) were done in M9* medium with 20 g L-1 glucose in sealed shake flasks at 30°C with and without 5 g L-1 yeast extract using Pseudomonas sp. strain VLB120 pCOM10-kivd. kivd overexpression was induced with 0.05% (v/v) DCPK at early exponential phase. In cultures of Pseudomonas sp. strain pCOM10 without overexpression of kivd none of the listed products were detectable. Errors indicate standard deviations (n = 2). Pseudomonas species are known for their ability to utilize a variety of organic molecules as growth substrates . This ability may contradict process efficiency by product or precursor degradation. To elucidate whether the desired product and/or precursors are degraded, growth experiments, using the respective compounds as sole carbon source were conducted (Table 2). Ps. sp. strain VLB120 is able to grow on all tested compounds with different carbon yields and growth rates. After pre-growth in the presence of the respective substrates to allow cell metabolism to adapt, isobutyric acid, isobutyraldehyde, and 2-ketoisovalerate (2-KIV) were converted allowing exponential growth rates between of 0.15 and 0.24 h-1, with the exception of isobutanol where only slow growth was observed. Biomass yields from glucose for isobutyric acid, and isobutyraldehyde are in the same range, while conversion of 2-KIV led to lower final biomass concentrations. Cells were cultivated in sealed shake flasks at 30°C on 10 mM of different carbon sources in M9* medium pH 7.0. Errors indicate standard deviations (n = 2 - 5). n.d.: not determined due to very slow growth (long time experiments result in errors caused by oxygen limitation and/or isobutanol evaporation). To optimize isobutyric acid production precursor and product degradation needed to be prevented or at least minimized. 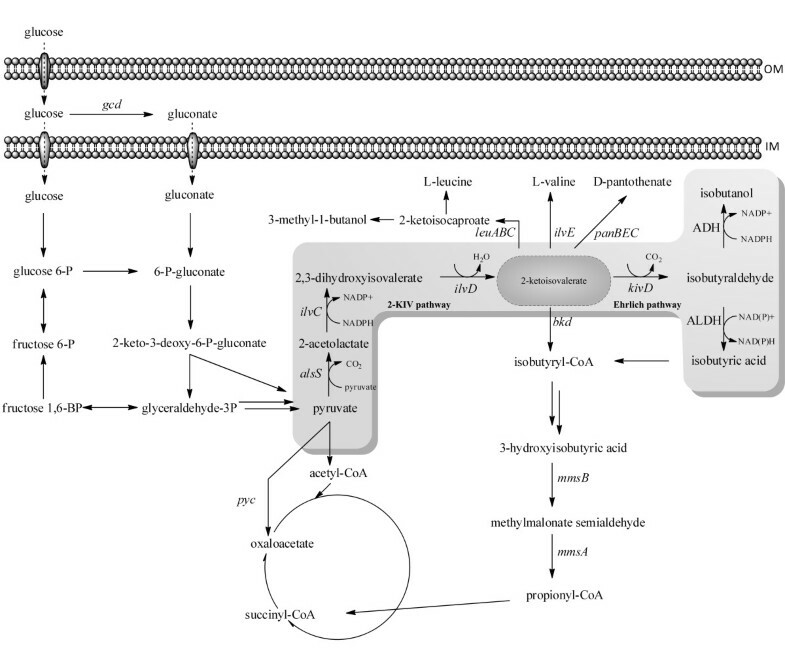 Based on the growth experiments and genomic data a map was constructed showing the overall pathways for isobutyric acid synthesis and its degradation in Ps. sp. strain VLB120 using glucose as carbon source (Figure 1). Pathways for isobutyric acid synthesis and its degradation in Ps . sp. strain VLB120. OM: outer membrane, IM: inner membrane, ADH: alcohol dehydrogenase, ALDH: aldehyde dehydrogenase, alsS: acetolactate synthase, bkd: branched-chain alpha-keto acid dehydrogenase gene cluster, gcd: glucose dehydrogenase, ilvC: ketol-acid reductoisomerase, ilvD: dihydroxy acid dehydratase, ilvE: branched-chain-amino-acid transaminase, kivd: 2-keto acid decarboxylase, leuA: 2-isopropylmalate synthase, leuB: 3-isopropylmalate dehydrogenase, leuC: isopropylmalate isomerase, mmsA: methylmalonate-semialdehyde dehydrogenase, mmsB: 3–hydroxyisobutyrate dehydrogenase, pyc: pyruvate carboxylase, panB: ketopantoate hydroxymethyl transferase, panE: ketopantoic acid reductase, panC pantothenate synthetase [19, 40, 53]. The degradation of valine was extensively investigated in P. putida and it was demonstrated that a branched chain α-keto acid dehydrogenase complex consisting of three proteins is responsible for the oxidation of 2-KIV to isobutyryl-CoA, which is further degraded to propionyl-CoA [34, 35] (Figure 2). In the genome of Ps. sp. strain VLB120, a homolog of this gene cluster (PVLB_17450, PVLB_17455, PVLB_17460 and PVLB_17465) was identified. To prevent the degradation of 2-KIV the gene coding for the E1 subunit of the branched chain 2-keto acid dehydrogenase (PVLB_17450) was deleted. The resulting Δbkd strain could not grow on 2-KIV as sole carbon source anymore (data not shown). Degradation of 2-KIV was investigated in Ps. sp. strain VLB120 Δbkd and the wild type strain, both harboring pCOM10-kivd (Figure 2). The mutant showed a lower degradation rate of 2-KIV, whereas the production titer of isobutanol and isobutyric acid increased significantly. Isobutyric acid accumulated over the first 30 h and was metabolized completely over the next 40 h, while isobutanol was again degraded at a slow rate (Figure 2, see also Table 2). Growing cell 2-ketoisovalerate biotransformations. Comparison of Ps. sp. strain VLB120 pCOM10-kivd (A) and Ps. sp. strain VLB120Δbkd pCOM10-kivd (B). Cultivations were performed in M9* pH 7.0, 5 g L-1 glucose in sealed shake flasks at 30°C. Cells were induced at early exponential phase with 0.05% (v/v) DCPK and 25 mM 2-KIV was added. ▼: 2-ketoisovalerate, □: isobutyric acid, ○: isobutanol. Two independent fermentations were performed, showing comparable results. Isobutyric acid is a carbon and energy source for Pseudomonas species and knowledge about the enzymes responsible for its degradation is limited. Godhue et al. showed the whole-cell biotransformation of isobutyrate to L-(+)-3-hydroxyisobutyrate in P. putida ATCC21244. This indicates the existence of an enzyme activity catalyzing the reaction from isobutyric acid to isobutyryl-CoA, which is a metabolite in the natural valine degradation pathway. Random mutagenesis of Ps. sp. strain VLB120Δbkd using N-methyl-N’-nitro-N-nitrosoguanidine (NTG) was performed to mutate the respective genes. NTG is one of the most widespread chemical mutagens, and well known for its ability to create auxotrophic mutants . In Pseudomonas species, it was used amongst others to optimize cinnamic acid and phenol production [9, 38]. The optimal compromise between cell survival rate and auxothrophy frequency was found at a NTG concentration of 80 μg mL-1, which is comparable to other reports [9, 39]. We modified a method, which was used by Martin et al. to create mutants of the valine degradation pathway. Mutants showing no alteration in growth on glucose and succinate but a drastically decreased growth rate and/or lag phase on isobutyric acid, were selected for further investigation (Additional file 1: Figure S1). 2-KIV biotransformations were performed with NTG-mutants harboring pCOM10-kivd (Figure 3). All mutants showed a change in their 2-KIV conversion rate. Some mutants (A10, A21, B57, B83, C82, D67) accumulated 3-hydroxyisobutyric acid and isobutyric acid, others only isobutyric acid (C18, D76, E82). Surprisingly, all mutants except D67 lost their ability to accumulate isobutanol even temporarily under these conditions. This product was only observed in resting cell assays, when 10 mM isobutyraldehyde were applied as substrate (Additional file 1: Figure S2). Mutant C18 was chosen as the candidate for further strain development, as it produced isobutyric acid with the highest yield compared to Ps. sp. strain VLB120Δbkd and no product degradation could be detected. Maximum achievable product titers of isobutyric acid, 3-hydroxyisobutyric acid, and isobutanol during 2-ketoisovalerate biotransformations. Growing Ps. sp. strain VLB120 NTG mutants transformed with pCOM10-kivd were utilized. Exemplarily concentration profiles of 2-KIV, isobutanol and isobutyric acid in the NTG mutant Ps. sp. strain VLB120 C18 are highlighted in the upper left box. Cultivations were performed in M9* pH 7.0, 5 g L-1 glucose in sealed shake flasks at 30°C. Cells were induced at early exponential phase with 0.05% (v/v) DCPK. At the same time point 25 mM 2-KIV was added. Hatched bars denote concurrent product degradation. ▼: 2-ketoisovalerate, □: isobutyric acid, ○: isobutanol. (n = 1, due to expensive substrate). In general, 2-KIV biotransformations showed a maximum yield of approximately 50% isobutyric acid from 2-KIV. This compound serves as a precursor for leucine, valine and panthothenic acid synthesis which negatively influences the final yield (Figure 1). To increase the flux to 2-KIV, the respective genes of the valine synthesis pathway were overexpressed in Ps. sp. strain VLB120 T7. This strain was developed to guarantee stable and high expression levels in the desired host under fermentative conditions. T7 promoter dependent expression turned out to be beneficial, as compared to Palk-dependent expression (Additional file 1: Figure S2). Ps. sp. strain VLB120 T7 was transformed with plasmids pPAPC-Km and pPDPK. For details on plasmid construction please see materials and methods. Activities for AlsS, IlvC, IlvD and Kivd were determined in crude cell extracts, and compared to activities in extracts of the wild type and Ps. sp. VLB120 pCOM10-kivd (Table 3). *: coupled assay together with AlsS. Cells were cultured in M9* pH 7.4, 20 g L-1 glucose and. 5 g L-1 yeast extract shake flasks at 30° Cells were induced for 4 h either with 0.05% DCPK (pCOM10) or with 1 mM IPTG (pPDPK, pPAPC-Km) in the early exponential phase. Errors indicate standard deviations (n = 2 - 3). All proteins showed higher specific activities in the desired production host as compared to the wild type strain. Under the fermentation conditions used, Kivd activity in Ps. sp. strain pCOM10-kivd was not even detectable, being in line with the eGFP expression study (Additional file 1: Figure S2), and demonstrated the advantage of T7 expression in Ps. sp. strain VLB120. 2-KIV and Ehrlich pathway overexpression in Ps. sp. 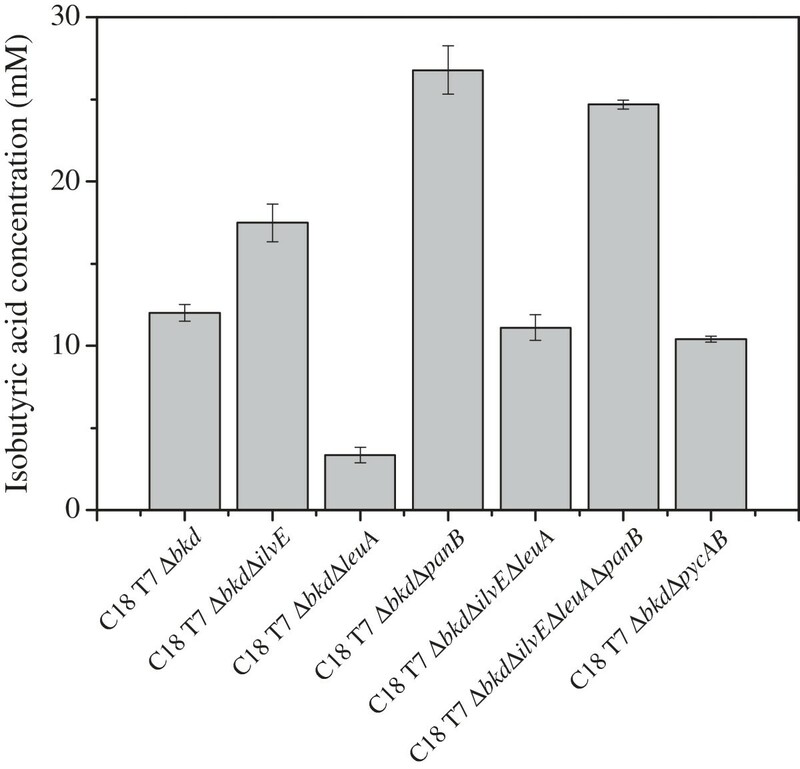 strain VLB120 T7 (Figure 4A) and in the genetic engineered variant C18 T7 (Figure 4B) resulted in drastically increased final isobutyric acid titers in aerobic fermentations. Shake flask experiments were carried out with carbon concentrations of 20 g L-1 glucose to avoid a pH drop. Cells were induced with 1 mM ITPG at an OD450 of about 10 (1.86 gcdw L-1) to obtain sufficient cell densities. After induction, the biomass concentration stayed almost constant during the rest of the experiment. By overexpressing the 2-KIV and the Ehrlich pathway, up to 13 mM isobutyric acid was produced in both strains. The wild type degraded the acid over the whole course of the experiment, traceable with the formation of 3-hydroxyisobutyric acid, a degradation product of isobutyric acid. The degradation was pronounced by glucose depletion resulting in the complete product metabolization within the next 30 h. In mutant C18 T7 no isobutyric acid degradation and, connected to that no 3-hydroxyisobutyric acid formation, was detectable. In both cases, glucose is partially converted to gluconate prior to the utilization for product or biomass generation. While the wild type completely exploited the carbon sources, C18 T7 did not completely convert the generated gluconate. Isobutyric acid production during a representative fermentation. Ps. sp. strain VLB120 T7. pPAPC-Km, pPDPK (A) and C18 T7 pPAPC-Km, pPDPK (B) were cultivated in M9* pH 7.4 medium initially containing 20 g L-1 glucose and 5 g L-1 yeast extract. Cells were induced with 1 mM IPTG at timepoint 0 h at an OD450 of 10. ▼: glucose, ◊: gluconate, ♦: biomass concentration, □: isobutyric acid, ○: isobutanol, Δ: 3-hydroxyisobutyric acid. Three independent fermentations were performed, all showing comparable results. In addition to the direct bypass of 2-KIV in the valine degradation pathway (catalyzed by bkd), 2-KIV is the precursor for the amino acids valine and leucine and the vitamin pantothenic acid in Pseudomonas. The branched-chain amino acid aminotransferase IlvE catalyzes, amongst others, the transamination of 2-KIV to valine. The 2-isopropylmalate synthase LeuA catalyzes the first step in leucine synthesis and PanB is a 2-ketoisovalerate hydroxymethyltransferase. To optimize the carbon yield, these competing pathways for 2-KIV were deleted. In addition, the genes coding for the pyruvate carboxylase (pycAB) were removed to prevent pyruvate withdrawal into the TCA-cycle due to anaplerosis. Single knockout mutants of ΔilvE, ΔleuA, ΔpanB, and ΔpycAB, and combined mutants of genes involved in 2-KIV metabolism were created and strains were transformed with production plasmids pPAPC-km and pPDPK. Figure 5 shows the results of fermentations conducted with a starting concentration of 20 g L-1 glucose in shake flasks. By deleting panB, the titer could be increased about 2.5-fold, ilvE deletion lead to a 1.5-fold increase. Mutants without a functional 2-isopropylmalate synthase showed decreased titers in single- as well as in double knock-outs. The deletion of the pycAB genes did not significantly influence the final titer of isobutyric acid. Fermentation of different C18 T7 mutant strains harboring the production plasmids pPAPC-km and pPDPK. Cultivations were done in shake flasks in M9* pH 7.4 starting with 20 g L-1 glucose and 5 g L-1 yeast extract. Induction was conducted with 1 mM IPTG at OD450 of 10. Error bars indicate standard deviations (n = 2). In the present study, different variants of recombinant Ps. sp. strain VLB120 have been constructed by means of directed and random mutagenesis, which are capable of producing significant amounts of C4-precursors from glucose in aerobic fermentations with the focus on isobutyric acid synthesis. Overexpressing simply one gene encoding for a branched chain 2-ketoacid decarboxylase (KivD) in Ps. sp. strain VLB120, enabled this organism to produce isobutyric acid, isobutanol, and 3-methyl-1-butanol, directly from glucose. Isobutyraldehyde was not detected in the fermentation broth, indicating direct intracellular conversion of this compound. Based on genome analysis, 32 aldehyde dehydrogenases (Additional file 1: Table S2), and about 19 alcohol dehydrogenases (Additional file 1: Table S3) have been identified in Ps. sp. strain VLB120 capable to either reduce or oxidize isobutyraldehyde. Among these enzymes are ALDHs homologs known to be highly active towards isobutyraldehyde (e.g. PVLB12825, a 42% homolog to padA of E .coli K12). In addition, the strain harbors ADHs known to be able to catalyze the reduction of isobutyraldehyde (e.g. PVLB10545, a 86% homolog to adhP of E. coli K12). However, gene deletions of these candidate genes did not significantly improve product titers (data not shown). Rodriguez et al. , aiming to overproduce isobutyraldehyde in E. coli BW25113, identified eight ADHs in the genome of E. coli BW25113 and observed that the final product titer could only be increased by combining multiple ADH deletions. While in E. coli BW25113 the degradation of isobutyric acid is not described , the present work shows that Ps. sp. strain VLB120 harbors a complete pathway for isobutyric acid utilization (Figure 1), which enabled Ps. sp. strain VLB120 to grow on isobutanol, isobutyraldehyde and isobutyric acid (Table 2). The existence of an isobutyric acid degradation pathway was already described for P. putida, Candida rugosa, Yarrowia lipolytica and Desulfococcus multivorans and used in mutant strains of the first three species for the synthesis of 3-hydroxyisobutyric acid using isobutyric acid as precursor [36, 42–45]. To prevent undesired isobutyric acid degradation, several mutants were created by random mutagenesis. The apparent correlation between isobutyric acid and 3-hydroxyisobutyric acid accumulation (in mutants B57, B83 and D67) indicates the mmsAB operon (PVLB_03765, PVLB_03770)  coding for methylmalonate-semialdehyde-dehydrogenase and 3–hydroxyisobutyrate dehydrogenase to be involved in the reaction of isobutyric acid to isobutyryl-CoA. Exemplarily, the respective DNA loci were sequenced in mutants B83 and C18. The DNA sequencing revealed, that mmsB is altered in variant B83. A transition (G/C → A/T) of nucleotide 413 occurred, confirming that this special transition is favored using NTG mutagenesis . On the protein level, this mutation leads to an exchange of the strictly conserved residue Gly137 with asparagine  and thereby explains the non-active 3-hydroxyisobutyirc acid dehydrogenase in mutant B83. Mutant C18 shows no alteration in the mmsAB operon. In this case, most probably a broad substrate range acetyl-CoA-synthetase or a global regulator involved in isobutyric acid degradation was affected by NTG mutagenesis [45, 49]. 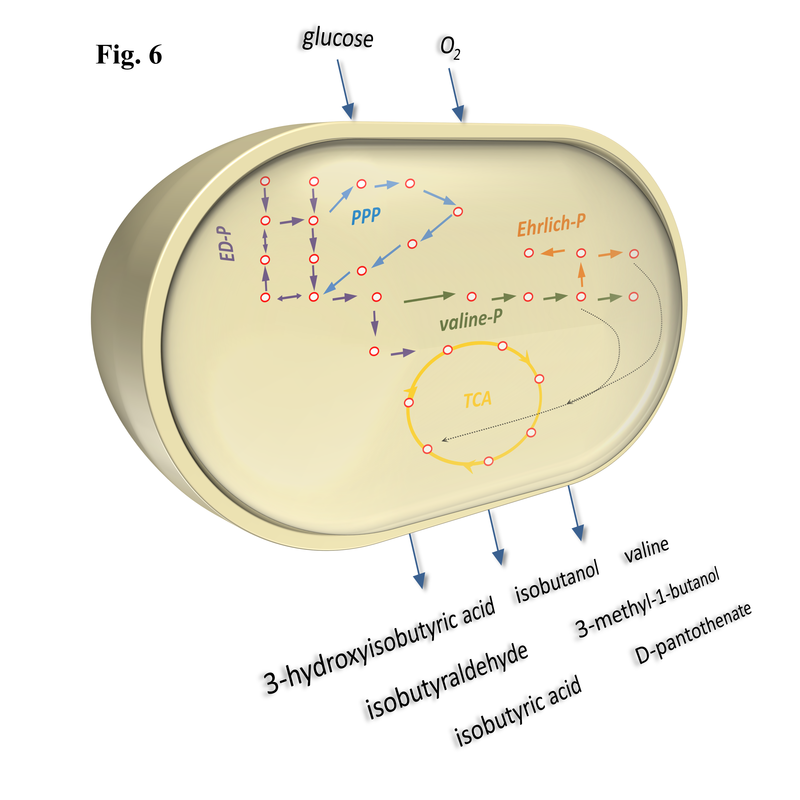 The efficient fermentative production of isobutyric acid requires the overexpression of the genes of the valine synthesis pathway (alsS, ilvC, ilvD), a keto acid-decarboxylase (kivd) and a highly expressed gene for an aldehyde dehydrogenase (ALDH). While ilvC, ilvD and the ALDH gene are expressed homologously, alsS and kivd are derived from other species and show an altered codon usage, which often results in lower expression levels . In order to maximize expression levels and overcome promoter related problems like catabolite repression by various carbon sources , the so far used Palk promoter was replaced by a T7 RNA polymerase based system. Using eGFP fluorescence as a fast and easily detectable read-out for expression (Additional file 1: Figure S2), the performance of this system was evaluated confirming recently published results for P. putida KT2440 T7 . In addition, enzyme activity assays of single pathway genes proved successful overexpression in Ps. sp. strain VLB120 T7 (Table 3). Overexpression of the 2-KIV synthesis pathway genes and kivd in the T7 variants of Ps. sp. strain VLB120 resulted in drastically increased isobutyric acid titers (Figure 4/ Table 1). In addition, the variant C18 T7 showed an increased stability of the formed product, which confirms the results of the 2-KIV biotransformations (Figure 2) under fermentative conditions. During glucose utilization, gluconate accumulated in Ps. sp. strain VLB120. This phenomenon is well understood and described in Pseudomonas species, which are known to metabolize glucose exclusively via the Entner-Doudoroff pathway, using 6-phosphogluconate as key intermediate . Ps. sp. strain VLB120 possesses a glucose dehydrogenase (PVLB_05240), but is lacking a gluconate dehydrogenase, which prevents 2-ketogluconate formation. 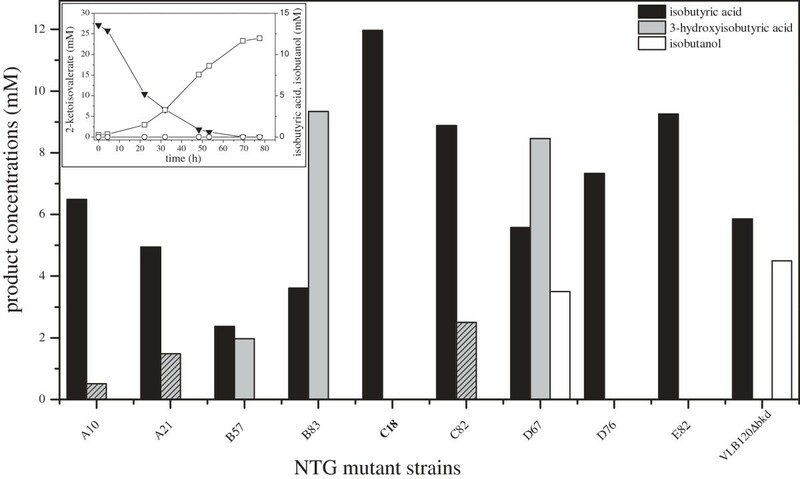 The incomplete conversion of gluconate in mutant strain C18 T7 is comparable to the behavior of Pseudomonas putida KT2440 during poly-hydroxyalkonate synthesis observed by Poblete-Castro et al. . In their work, they enhanced the production of PHAs by the deletion of glucose dehydrogenase without affecting the specific growth rate. One may speculate, that this deletion leads to an increased flux towards pyruvate and thus more precursors for isobutyric acid synthesis are available. To prevent unproductive 2-KIV depletion via isobutyryl-CoA or various amino acid synthesis pathways (Figure 1), the influence of the genes bkd, ilvE, leuA, pycAB and panB was investigated. The strongest effect on isobutyric acid titers was measured for the mutants ΔpanB and Δbkd. By deleting subunit A of the branched chain α-keto acid dehydrogenase complex (bkd), growth on 2-KIV could be completely inhibited in Ps. sp. strain VLB120. Growth could be restored by overexpressing the decarboxylase gene kivd, channeling 2-KIV over isobutyraldehyde (Figure 1). The mutant strain shows drastically increased product concentrations of isobutyric acid and isobutanol during 2-KIV biotransformations, while during growth on glucose (fermentation) this effect seems to be insignificant, as the production rate of Ps. sp VLB120Δbkd C18-T7 harboring Δbkd is comparable to Ps. sp VLB120. Under fermentative conditions comprising high glucose und only low 2-KIV concentrations the activation of 2-KIV to isobutyryl-CoA seems to be only a minor carbon sink. Similar observations have been reported by Lu et al. for Ralstonia eutropha. Deletion of ilvE helped to prevent undesired carbon loss, this confirms similar results reported for C. glutamicum and R. eutropha[55–57]. Deletion of panB had the strongest impact on carbon yield for isobutyric acid synthesis. panB is the first gene of pantothenic acid synthesis pathway, and in addition a precursor for CoA . The deletion of panB seems to increase 2-KIV availability, as also described for C. glutamicum[59, 60], and thereby results in an increased carbon yield of 0.12 ± 0.01 g g-1, which is about 25% of the theoretical maximum. panB deletion leads to mutants unable to grow on minimal medium (most probably connected to the disability to synthesize CoA). For E. coli BW25113 10 g L-1 on a 5 mL scale using 40 g L-1 glucose has been reported  while for Ps. sp. strain VLB120 2 g L-1 have been observed using only 20 g L-1 carbon source. Experiments have been conducted in shake flasks with glucose excess where gluconate temporarily accumulated resulting in a pH drop to pH 6.8 which was even more pronounced during isobutyric acid formation. To prevent this pH drop, hampering catalyst robustness, glucose needs to be limited and the pH controlled. It is to be expected, that in such a controlled environment (bioreactor) higher final product titers and better carbon yields will be reached. In consequence, the application of the demonstrated design principles, the use of the genome sequence of Ps. sp. strain VLB120 and the established metabolic engineering tools, will give access to a far broader product spectrum. Based on the engineered, highly active 2-KIV synthesis pathway the production of isobutanol, 3-methyl-1-butanol, 3-hydroxyisobutyric acid, isobutyraldehyde, valine and D-pantothenate would be feasible by slight pathway modifications. Beside the synthesis of isobutyric acid, we were already able to detect the Ehrlich pathway products isobutanol and 3-methyl-1-butanol, which are interesting bulk chemicals [33, 61]. More over 3-hydroxyisobutytric acid was accumulated in the not optimized mutant B83 with remarkable titers, being highly valuable synthons for the fine chemical industry . The combination of an increased flux towards isobutyric acid using a tailor-made expression system and the prevention of precursor and product degradation allowed efficient production of isobutyric acid in Ps. sp. strain VLB120. This work experimentally verifies the genome derived metabolic network structure. A true platform organism was designed, which has the ability to produce an even wider product spectrum directly from glucose by only slight changes on the level of cell metabolism. In general, studies investigating Pseudomonas for the fermentative production of chemicals are few . But clear benefits like low/no byproduct formation during glucose fermentation, high tolerance towards toxic substances , improved NAD(P)H regeneration rates under stress conditions , and a diverse gene repertoire for the processing of organic molecules underline the potential of Pseudomonads for industrial applications. The strain engineering of this novel organism sets the stage for the development of aerobic biofilm based processes for the continuous production of isobutyric acid and other secondary metabolites. Apart from increasing product titers, the long-term catalyst robustness is a most important but often neglected issue in host engineering, which will be a key focus in future studies regarding this newly introduced organism. All chemicals used in this study were purchased from Sigma-Aldrich (Steinheim, Germany) or Carl Roth GmbH (Karlsruhe, Germany), unless stated otherwise. The chemicals were of the highest purity available and used without further purification. The bacterial strains and plasmids used in this study are listed in Table 4. Ampr: ampicillin resistance; Cmr: chloramphenicol resistance; Kmr: kanamycin resistance; Gmr: gentamicin resistance. Ps. sp. strain VLB120 was used as production host, while E. coli DH5α and E. coli DH5α (λ-pir) served as host strains for all plasmid based DNA manipulations. Ps. sp. strain VLB120 and E. coli strains were cultivated at 200 rpm, 30°C or 37°C (Infors AG, Bottmingen, Switzerland), respectively. For all cloning purposes, transformations and first precultures, cells were cultivated in lysogeny broth (LB, ). All other cultivations were performed in M9* minimal medium  which was supplemented with 1 mL L-1 US* trace element solution  and 2 mL L-1 1 M MgSO4 solution. For fermentations and cultivations used to prepare cell extracts, 5 g L-1 yeast extract and 0.001% (w/v) thiamine solution was added. Depending on the experiment, either glucose (5 g L-1 or 20 g L-1), isobutyric acid (10 mM), isobutyraldehyde (10 mM), isobutanol (10 mM), succinate (10 mM) or 2-ketoisovalerate (10 mM) served as carbon sources. All media were supplemented with appropriate antibiotics (kanamycin 50 μg mL-1 for E. coli and Ps. sp. strain VLB120, gentamycin 25 μg mL-1 for E. coli and Ps. sp. strain VLB120, chloramphenicol 34 μg mL-1 for E. coli). For cultivations in minimal media, Ps. sp. strain VLB120 was cultivated in two subsequent precultures prior to the main culture. First, the strain was cultivated for 8 h in tubes filled with 5 mL LB overnight. 50 μL of this culture was used as inoculum for a fresh 5 mL M9* culture. After overnight growth 50 mL M9* medium in a 250 mL flask were inoculated to an initial OD450 0.2. Ps. sp. strain VLB120 cultures were either grown under aerobic conditions in open baffled shake flasks or under micro aerobic conditions in sealed baffled shake flasks to prevent the evaporation of volatile compounds. For experiments investigating the utilization of different carbon sources by Ps. sp. strain VLB120 preculture derived cells were washed with M9* salt solution before inoculating fresh M9* medium complemented with the respective carbon source. Random mutagenesis by NTG was performed according to Adelberg et al. and Martin et al. [37, 40]. 5 mL M9*-medium (pH 7.4, 10 mM succinate as carbon source) was inoculated with 50 μL of an 8 h LB culture of Ps. sp. strain VLB120Δbkd and cultured overnight. This culture was used to inoculate the main culture (250 mL M9*, 10 mM succinate). Early exponential phase cells were harvested by centrifugation (10 min, 4.500 g, 4°C), washed and concentrated in CpI-Buffer (127 mM Na2HPO4∙2H2O, 36.2 mM Citric acid, pH 6.0) to an OD450 of 6 before 80 μg mL-1 NTG was added. Cells were incubated for 30 min, washed, resuspended in LB and stored for screening in 10% (w/v) glycerol at −80°C. To screen for mutants with changed properties regarding isobutyric acid degradation, 5 mL M9* medium containing 10 mM succinate were inoculated with NTG treated cells (see above). After overnight cultivation, cells were harvested by centrifugation, washed in identical medium without carbon source, and used to inoculate fresh 5 mL M9* medium with 10 mM isobutyric acid as sole carbon source to an OD450 of 0.2. After reaching an OD450 of 0.4, solid ampicillin was added up to its solubility limit (13 mg mL-1) and cultivation was continued for additional 8 hours. Afterwards, cells were harvested by centrifugation, washed twice with M9* medium, plated in appropriate dilutions to M9* plates containing 10 mM succinate as carbon source, and incubated at 30°C for 48 h. Mutants were replica plated on M9* medium containing 10 mM isobutyric acid and on LB medium. Mutants unable to grow in the presence of isobutyric acid as sole carbon source were selected for further investigations. For the preparation of cell extracts, cells were cultivated in M9*(pH 7.4, 20 g L-1 glucose) and depending on the plasmid used induced either with 1 mM IPTG or 0.05% DCPK during exponential phase (OD450 0.5). After 4 h of induction, cells were harvested by centrifugation, washed, and resuspended to cell density of OD450 100 in ice cold buffer (50 mM Kpi pH 7.0, 0.5 mM dithiothreitol). Cells were disrupted by three passages through a precooled French press (5.5 MPa, SLM-Aminco, Rochester, NY, USA) and cellular debris was removed by centrifugation (20 min, 17,000 g, 4°C). Cell extracts were always prepared freshly and kept on ice. Total protein concentrations were determined using the Bradford protein assay . The activity of acetolactate synthase (AlsS) was assayed according to Lang et al. , using 50 mM Kpi buffer (pH 7.0). The activity of ketol-acid reductoisomerase (IlvC) was determined according to Leyval et al. . The assay was coupled to the activity of AlsS using 50 mM pyruvate as substrate instead of 2-acetolactate. The activity of dihydroxy acid dehydratase (IlvD) was quantified according to Atsumi et al. . The substrate, 2,3-dihydroxy-isovalerate was purchased from SelectLab Chemicals GmbH (Bönen, Germany). The assay was conducted at 30°C for 30 min. 2-keto acid decarboxylase (Kivd) activity was determined by measuring the isobutyraldehyde concentration using HPLC analysis. Therefore, 500 μL 50 mM potassium phosphate buffer (pH 7.0) containing 10 mM MgCl2, 0.5 mM thiamine diphosphate, cell free extract, and 10 mM 2-KIV was incubated at 30°C for 30 min. The reaction was started by the addition of 2-KIV and stopped by the addition of 10 μL pure perchloric acid. Cell densities were monitored by measuring the optical density at 450 nm (OD450) using a spectrophotometer (Biochrom Libra S12, Cambridge, UK). One OD450 unit corresponds to 0.186 gcdw L-1 for Ps. sp. strain VLB120. Organic acids, sugars, alcohols and aldehydes were detected by HPLC (LaChrom Elite, Merck Hitachi, Darmstadt, Germany) equipped with a Trentec 308R-Gel.H ion exclusion column (300 × 8 mm, Trentec Analysentechnik, Gerlingen, Germany). The following conditions were applied; temperature: 40°C, isocratic flow rate: 1.0 ml min-1, solvent: 5 mM H2SO4, injection volume: 20 μL. Analytes were detected either by a UV (λ = 210 nm) or RI detector. Lower product concentrations (< 500 μM analyte) were quantified on a Finningan Focus GC (Thermo Electron Corporation, Dreireich, Germany) with a Rt-βDex-sm column (30 m × 0.25 mm × 0.25 μm, Restek GmbH, Bad Homburg, Germany): GC oven temperature was 40°C for 5 min before it was increased to 80°C at a rate of 20°C min-1, and to 105°C at a rate of 7°C min-1. The maximum temperature of 200°C was reached at a rate of 60°C min-1 and kept for 3 min. Samples were extracted with 1:1 (v/v) ice cold diethyl ether containing 0.2 mM dodecane as internal standard. eGFP fluorescence was measured using a microtiter plate reader (Infinite M200, Tecan, Mannedorf, Switzerland) at 488 nm and 511 nm for excitation and emission, respectively. Cells were harvested by centrifugation, washed and resuspended in 50 mM Tris buffer pH 8.0. Biomass concentrations were adjusted to OD450 0.4 using 50 mM Tris-Cl pH 8.0. Restriction enzymes, T4 ligase, thermosensitive alkaline phosphatase, T4 polynucleotide kinase, and high-fidelity phusion DNA polymerase were purchased from Fermentas GmbH (St. Leo-Rot, Germany). All enzymes were used according to supplier’s recommendations. Plasmid DNA was isolated with a miniprep Kit (Peqlab GmbH, Erlangen, Germany). Gel extraction and DNA purification were performed with a NucleoSpin Gel and PCR clean-up Kit (Macherey-Nagel GmbH, Düren, Germany). All DNA manipulations were performed using standard procedures . Restriction sites, which were added to the respective DNA fragments using PCR amplification, are listed in the primer section (Additional file 1: Table S2). Transformations were performed by electroporation (2500 V, Equibio EasyjecT Prima, Ashford, UK) using sucrose-treated competent cells  and glycerol-treated competent cells  for Ps. sp. strain VLB120 and E. coli DH5α, respectively. The kivd gene was artificially synthesized (Geneart AG, Regensburg, Germany) in pMA-RQ-kivd based on available sequence data of Lactococcus lactis subsp. lactis strain IFPL730 (GenBank: AJ746364). kivd was cut from the original delivered plasmid at artificially inserted restriction sites NdeI and AscI and ligated into pCOM10 creating pCOM10-kivd. eGFP was amplified using primers KL35/36 digested and ligated into pCOM10 to create pCOM10-eGFP. pCOM10-kivd was cut with NdeI and SalI and the fragment was ligated into pBR22b creating pBR22b-kivd. The alsS gene was amplified in two fragments from genomic Bacillus subtilis DNA using primers KL1/2 and KL3/4, respectively, which were designed based on available sequence data (Genbank: AP012496 region: 3537181). The fragment was ligated into pBR22b creating pBR22b-alsS. To ensure an appropriate antibiotic selection pressure in Ps. sp. strain VLB120, a kanamycin cassette was amplified from pJQhdp::Km by primers KL11/12 and the phosphorylated fragment was ligated into dephosphorylated pBR22b-alsS cut with BoxI, creating pBR22b-alsS-Km. ilvC (PVLB_03705) and ilvD (PVLB_01425) were amplified from genomic Ps. sp. strain VLB120 DNA using primers KL 5/6 and KL 7/8, respectively. The fragments were inserted in pBR22b creating pBR22b-ilvC and pBR22b-ilvD. eGFP was amplified using primer KL35/36 digested and ligated into pBR22b to create pBR22b-eGFP. ilvC including the T7 promoter and the ribosomal binding site (RBS) was amplified from pBR22b-ilvC with primers KL13/14. The fragments were inserted into the dephosphorylated vector pBR22b-alsS-Km creating pPAPC-Km. ilvD including the T7 promoter, the RBS, and the T7 terminator was amplified from pBR22b-ilvD using primers KL29/30 and the phosphorylated, digested fragment was ligated into the dephosphorylated Bst1107I cut pCOM8 creating pCOM8-ilvD. Orientation of the fragment was determined using XhoI restriction and the vector with the same orientation of ilvD and Gmr cassette was used for further work. kivd including the T7 promoter, and the RBS was amplified from pBR22b-kivd using primers KL27/28 and the phosphorylated, cut fragment was ligated into the dephosphorylated, restricted pCOM8-ilvD creating pPDPK. Deletion of the gene coding for subunit A of the branched chain α-keto acid dehydrogenase (bkd) was achieved as described earlier using pJQ200SK . For the construction of pJQ200bkd::Km, genomic Ps. sp. strain VLB120 DNA was used as template to amplify the up- and downstream fragment of bkd using primers K15/16 and K17/18. Kmr-loxP was cut from pJQhdp::Km with XbaI and purified by gel electrophoresis. All three parts were ligated in one pot and Ps. sp. strain VLB120 was transformed with the verified vector. Kanamycin resistance was used to prove genomic integration of pJQ200bkd::Km. To distinguish between single crossover and double crossover events, mutants were screened by replica plating for kanamycin resistance and gentamycin sensitivity. Positive clones were confirmed using colony PCR with primers KL15/18. Kmr-cassette was removed by using cre recombinase. Positive mutants were transformed with pTnCre and a single colony was picked to inoculate a 5 mL LB culture including 0.1 mM sodium salicylate to induce cre recombinase expression. After 4 h, the culture was appropriately diluted and resulting kanamycin sensitive colonies were cured from pTNCre by subsequent inoculation and screening for gentamycin sensitive colonies. To obtain all other deletion mutants, the recently published gene editing method for Pseudomonas species using the pEMG/pSW-2 system was used . This system allows faster identification of positive clones compared to the pJQ200SK method. Up- and downstream regions of the desired genes were amplified by PCR using the following primers (KL19/20 and KL21/22 for ilvE, KL23/24 and KL25/26 for pycAB, KL37/38 and KL39/40 for leuA, KL41/42 and KL43/44 for panB) and purified via gel electrophoresis. The resulting up- and downstream fragments were fused by PCR using primers (KL19/22 for ilvE, KL23/26 for pycAB, KL37/40 for leuA, KL41/44 for panB) and after gel electrophoresis, cut and ligated into the identically treated pEMG vectors. Ps. sp. strain VLB120 was transformed with the respective plasmids and single crossover mutants were identified using cPCR. Positive clones were transformed with pSW-2. I-SceI nuclease activity was already present in Ps. sp. strain VLB120 pSW-2 without additional induction of xylS with 3-methylbenzoate, thus colonies were replica plated to screen for kanamycin sensitive mutants. Gene deletion mutants were identified by cPCR using primers KL31/32 for ilvE, KL33/34 for pycAB, KL45/46 for leuA, and KL47/48 for panB. Positive clones were cured from the pSW-2 plasmid by repeated inoculation and screening for gentamycin sensitive mutants. To establish Ps. sp. strain VLB120 as host for aerobic fermentations, the gene encoding for a T7 RNA polymerase under the control of a UV5 promoter and its regulator gene lac Iq were integrated in the genome using a Tn7-transposon. Kmr-loxP, was isolated from pJQhdp::Km with XbaI, purified by gel electrophoresis and ligated into XbaI cut, dephosporylated mini-Tn7-T7-Gm creating mini-Tn7-T7-KmLoxP. Ps. sp. strain VLB120 was transformed by electroporation with mini-Tn7-T7-KmLoxP and pTNS1 and kanamycin resistant mutants were checked by cPCR and primers KL9/10 for correct genomic integration of genes coding for lacI q and T7 RNA polymerase. The Kmr-cassette was removed as described above. To compare the effectiveness of the two different expression systems, eGFP fluorescence was used as a fast and easily detectable read-out for expression (Additional file 1: Figure S2). Depending on the carbon source, the fluorescence signal is about 3–6 fold higher in pBR22b-eGFP carrying strains, as compared to strains carrying pCOM10-eGFP. In both systems, the highest eGFP levels could be obtained on citrate as carbon source whereas in the presence of glucose only half of the fluorescence signal could be measured. The biggest difference was observed in complex medium; an approximately 6-fold higher eGFP concentration could be detected in Ps. sp. strain VLB120 pBR22b-eGFP. With regard to the fermentative production of isobutyric acid, the utilization of complex medium compounds might increase the maximum achievable product concentrations (Table 1). In addition, the eGFP expression for pBR22b as well as for pCOM10 was found to be tightly controlled in Ps. sp. strain VLB120 (T7). Without induction only a negligible amount of eGFP expression was detected. This study was financially supported by the Graduate Cluster Industrial Biotechnology (CLIB2021) at TU Dortmund University. We are grateful to Nick Wierckx of BIRD Engineering BV, Delft and Victor de Lorenzo of 552 CNB, CSIC, Madrid for providing required plasmids. KL and KB designed experiments; KL and JZ performed the experiments; KL, KB and AS analyzed the data; KL and KB wrote the paper. All authors read and approved the final manuscript.